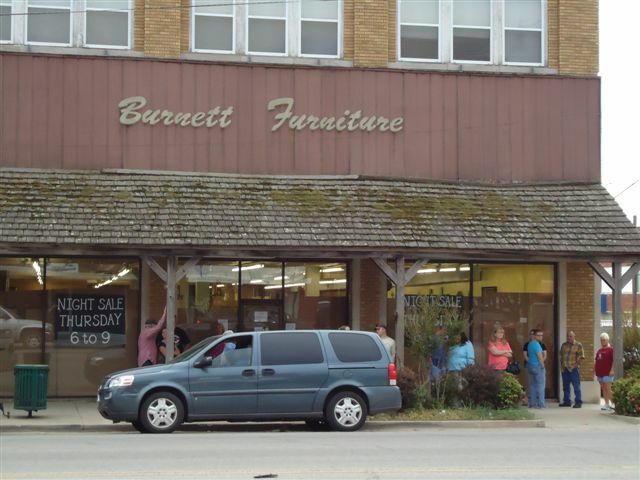 Burnett Furniture getting ready for the big sale. 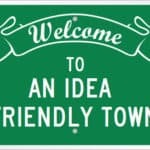 Sending you an invite to come to Henryetta and see what happens on our Main St. two times a year. Our large home-town family owned furniture store (Burnett’s) does a blow-out sale in April and November every year where the manufacturer’s representatives actually attend and serve as sales staff on the showroom floor because there are literally hundreds of people who come to the 3-hour sale. They line up outside the doors of the store for an hour before the doors open. 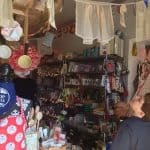 The dealer will close down this evening and cardboard up the windows until the night of the sale in order to re-price everything in the store. The other merchants in the same block figured out awhile ago that this was a captive market for those few hours. The Men’s store next door stays open (Bob’s Clothiers) and does a tremendous business. The Flower/Gift shop and Jewelry store (Rheba’s and Cave’s) also stay open until about 8 and do a good trade. The Burnett Hardware Store and Burnett Gift Store in the next block participate in the sale and the hardware store also has manufacturer’s representatives on hand to do special orders on lawn tractors, chippers, tillers. 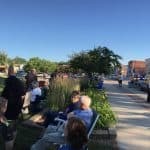 This year, there was even a church youth group that set up a Hamburger cookout to raise money for their Relay for Life team and they made several hundred dollars in a couple of hours on the light crowd. It’s a real phenomenon. Reminds me of when our Main Street was bustling like that every weekend and during the holiday season. I grew up in Enid and we used to have Crazy Daze the last Saturday in July. The sales were great, sales people dressed up like it was Halloween, and there were hundreds of people shopping downtown and Sunset Plaza. In the 90s, Crazy Daze started to wane. No one dressed up and the sales weren’t enticing. It’s sad, really, that the merchants don’t see that Crazy Daze was more than just a sale. 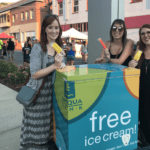 It was the entire community coming together and enjoying the day, shopping, putting money back in the economy, and maybe sparking new loyalty for your store. I used to return to Enid just for Crazy Daze, but I haven’t done that in a few years because it’s just not the even it used to be. Kudos to Gayle and her team for making this work!